Q: This morning, the train carrying the injured Chinese nationals and the bodies of the deceased in the major traffic accident in the DPRK has arrived in Shenyang. Could you give us more information? A: Late last night, the train arranged by the DPRK side set off from Pyongyang, carrying the injured and the bodies of the Chinese who perished in the tragic traffic accident back home. Supreme Leader Kim Jong-un of the DPRK went to see off the train and again expressed his deep condolences to the deceased and their families. He boarded the train to extend his consolation to the injured. The DPRK side also arranged for senior officials of the party and government to travel along. Chinese Ambassador to the DPRK Li Jinjun, the task force of the Chinese Embassy and the Foreign Ministry, and medical experts were also on board. On the same day, Chairman Kim Jong-un and other DPRK leaders sent messages of condolences to Chinese leaders. At 9 o'clock this morning, the train arrived in Shenyang, Liaoning province. Vice Minister Gao Xiaobing of the Ministry of Civil Affairs was there on behalf of the Chinese side to receive the train. China's relevant departments and local governments will continue to assist the families in the follow-up matters. Q: Sources have told Reuters that US prosecutors in New York have been investigating whether Huawei violated US sanctions in relation to Iran. Does China have any comment on that? A: I have noted relevant reports. 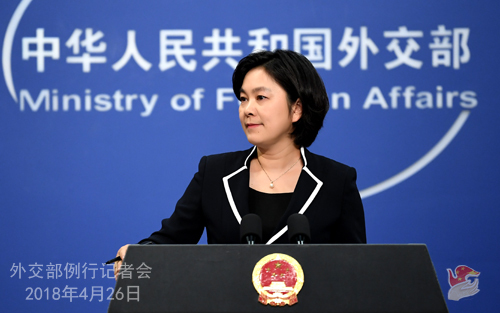 China's position on opposing one country imposing unilateral sanctions in accordance with its domestic laws is consistent and clear. This morning, the spokesperson of the Commerce Ministry of China has made clear our position on the relevant issue. We hope that the US could stop undermining foreign investors' confidence in the business environment of the US and refrain from hurting the normal, fair and mutually beneficial development of international investment and trade. Q: The SCO Council of Foreign Ministers Meeting was held in Beijing on April 24, the first meeting after India and Pakistan were admitted to the group. How do you see the development and the prospect of the SCO after the admission of India and Pakistan? A: Over the past 17 years since the inception of the SCO, the member states have been working to consolidate political mutual trust, deepen cooperation in the fields of security, economy and people-to-people exchanges, and carry out extensive international interactions under the "Shanghai Spirit" of mutual trust, mutual benefit, equality, consultation, respect for cultural diversity and pursuit of common development. These efforts have made enormous contributions to upholding regional security and stability and promoting common development and prosperity. After the admission of India and Pakistan, the SCO has become a comprehensive regional organization with the largest population and geographic coverage and immense potential. It will surely play a more positive role in the regional and international affairs. During the SCO Council of Foreign Ministers Meeting on April 24, State Councilor and Foreign Minister Wang Yi and foreign ministers of other member states including India and Pakistan exchanged views in great depth and reached important consensus on the Qingdao Summit preparations and the SCO development. 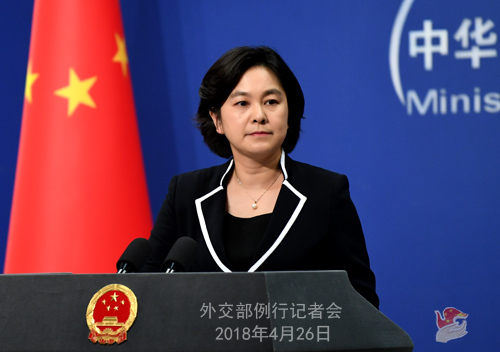 The foreign ministers agreed that they will carry forward the "Shanghai Spirit", remain true to their original aspirations, keep pace with the times, enhance solidarity and mutual trust, deepen cooperation across the board, and build a new type of international relations featuring mutual trust, equity, justice and win-win cooperation and a community with a shared future for all mankind. 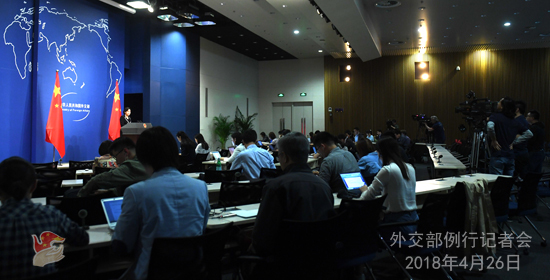 All parties reaffirmed their support to China in making best preparations for the Qingdao Summit as the rotating chair to ensure fruitful outcomes of the Summit and propel the development of the SCO at a new starting point. Q: The historic DPRK-ROK summit will be held tomorrow. What are China's expectations for this? A: The DPRK-ROK summit will be held tomorrow. The DPRK and the US are also making intensive preparations for their summit. We hope that their summits will be a success so that there will be more and more good news on the Korean Peninsula issue, setting us on the right path to the lasting peace of the Peninsula. Q: According to reports, the Indian government is considering appointing Bollywood film star Aamir Khan as the country's brand ambassador to China. Aamir Khan responded that he is willing to serve as a bridge between India and China to promote bilateral exchanges. What is your response? A: I have seen relevant reports. We all know that Aamir Khan is a famous Indian actor. Many Chinese people, including myself, have watched his film Dangal which tells the inspirational story of how Mahavir Singh Phogat and his daughters strived and persisted until their dream came true. At present, under the strategic guidance of the Chinese and Indian leaders, bilateral ties are enjoying a sound momentum of development, with the flourishing cultural and people-to-people exchanges in particular. Our two countries have forged 14 pairs of sister cities and provinces. Last year, there were over one million mutual visits between the two countries and more than 20,000 Indian students studied in China, and very week, 42 flights flied to and fro between our two countries.Yoga and Bollywood films have become the trendy things to do among the young Chinese people. These exchanges have enhanced the mutual understanding, friendship and mutual trust between our two countries and have made our two peoples feel closer to each other. Tomorrow, President Xi Jinping and Prime Minister Narendra Modi will hold an informal meeting in Wuhan, during which they will have an in-depth exchange of views on the overall, long-term and strategic issues concerning the future development of China-India relations. We stand ready to work with the Indian side and take this important meeting as an opportunity to strive for faster and better development of China-India relations at a new starting point.